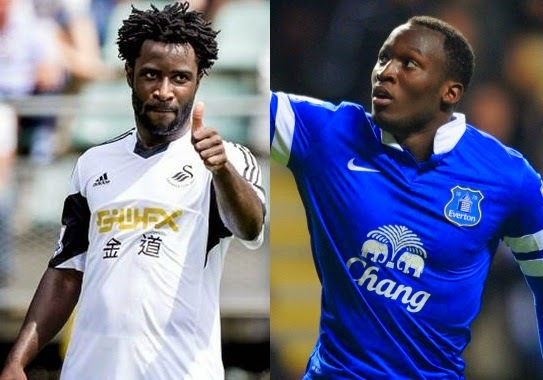 Bony or Lukaku, who should Liverpool sign? Bony or Lukaku, who should Liverpool sign? a detailed stats and analysis comparison of Wilfried Bony and Romelu Lukaku both are being eye by Liverpool. With the timely departure of Luis Suarez from the club, Liverpool are looking to bolster their striking options after capturing Lazar Markovic from Benifica. With their mid effectively covered, it is expected now the Liverpool board will turn their attentions to partner Daniel Sturridge with an effective goal scorer. Although Liverpool have already captured Rickie Lambert, still having on the wrong side of 30’s the former Southampton man cannot start every match for the reds. In the void left by the Uruguayan at the Merseyside, Liverpool are reportedly looking towards Wilfred Bony. So one thing is clear from the above mentioned stats that both the strikers stand side by side when it comes to scoring goals. And one more thing where both of them draws credit is the fact that both of them have their 1st season at respective clubs and with star performances like these, they have only raised their claim. In the absence of Luis Suarez, Liverpool might need a good striker upfront to supply the ammunition to the partner Sturridge. With Steven Gerrard reaching the climax of his career and new signings like Can and Markovic in their ranks, they might need some Premier League experience upfront. Here are the stats comparing the duo. While Swansea favored more tiki taka approach in their ranks last season, Everton were based on individual performances. As the stats shown above suggests, it is the Belgian that is leading the ranks when it comes to helping his team mates. However with an average duel win percentage of 47% as compared to 40% to that of Lukaku, the Ivory Coast forward can provide Liverpool the versatility that they have been lacking against strong physical sides. One thing where Bony might offer Liverpool more treasure is the longevity that he offers. Coming from a club like Vitesse to relegation threatened side Swansea, he managed to score 37 league goals in his last two seasons at both clubs. In retrospect, Lukaku managed 32 league goals in last two seasons following season long stints at West Bromvich and Everton. So one thing that neither of them will be shy off to bless the Anfield ranks with is goals. However keeping in mind the Champions league prospect and Liverpool facing 4 competitions next season, it is Wilfred Bony who just might lead the race for a box to box striker for Liverpool.